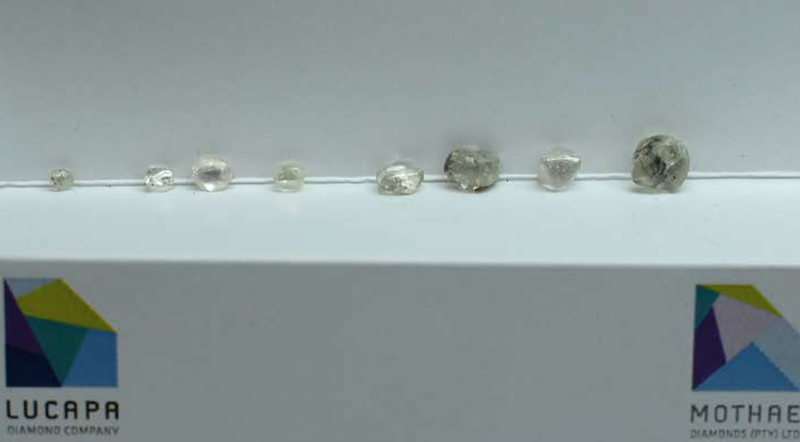 Selection of white stones (pre-acid) from the diamonds recovered in the first BSP run at Mothae. Photo by Lucapa. Australia’s Lucapa Diamond (ASX:LOM) announced that, for the first time, workers at its 70% owned Mothae mine in Lesotho have recovered diamonds sourced from residual material and kimberlite stockpiles. In a press release, the company explained that the gems were recovered through the existing bulk sampling plant and infrastructure at Mothae, which has been refurbished ahead of schedule as part of a previously announced bulk sampling program. This program, Lucapa explained, was designed to provide additional resource and diamond data to expand the life of mine, while also generating early cash flows. According to the media statement, the largest diamond recovered in the first test run was 6.6 carats. The stone was admired by Lucapa representatives, advisors, brokers and investors who visited the site following the Mining Indaba Conference that took place in Cape Town on February 5-8, 2018. Mothae is located within 5 km of Gem Diamonds' (LON:GEMD) Letšeng mine, which in mid-January yielded a 910-carat rock, the fifth biggest gem-quality diamond ever found. “Like Letšeng, trial mining has demonstrated Mothae to be a source of large and premium-value diamonds,” the firm’s website states.